Unfinished design for a chimneypiece in antique style showing a Corinthian column and pilaster as jambs with a lintel of figures in relief with guttae below. 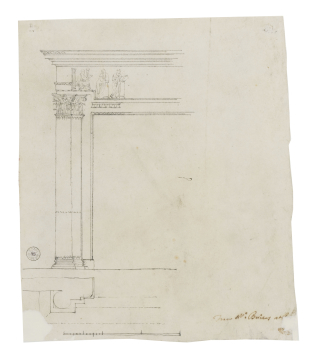 You are here: CollectionsOnline / Unfinished design for a chimneypiece in antique style showing a Corinthian column and pilaster as jambs with a lintel of figures in relief with guttae below. This is one of two sheets of chimneypiece designs by James Byres (1734-1817) (see Adam vol.26/184), which, like the ceiling designs in Adam vol.26/166, 167, 170, 174 and 176 are probably copies of drawings sent to London, presumably in the 1760s. The inscription is in the same hand as the other Byres' copies in this volume. None of the compositions seems remarkable compared with the Adam designs of that period and are tame when contrasted with those in G. B. Piranesi's Diverse Maniers d'adornare i cammini (Rome, 1769). There are chimneypieces by Byres at Badminton in Gloucestershire, England, and Fyvie Castle in Aberdeenshire, Scotland, all dated 1773 (see H. Colvin, A Biographical Dictionary of British Architects, 1600-1840, 3rd edn. London, 1995, p.205). James Byres turned from painting to architecture c.1758 while in Rome, and in 1762 he won a prize in the Concorso Clementino. At that time he was known to James Adam's circle (see J. Fleming, Robert Adam and His Circle in Edinburgh & Rome, London, 1962, p.378).